Orleans County is a county located in the U.S. state of New York. As of the 2010 census, the population was 42,883. The county seat is Albion. The name is in honor of the French Royal House of Orleans. According to the U.S. Census Bureau, the county has a total area of 817 square miles (2,120 km2), of which 391 square miles (1,010 km2) is land and 426 square miles (1,100 km2) (52.12%) is water. The high proportion of water is due to the extension of Orleans County north into Lake Ontario to the Canadian border (a line of latitude running through the middle of the lake). The distance from the Orleans shore north to the international border is greater than the distance from the shore south to the Genesee County line, meaning the area of Orleans underwater is actually greater than that above water. 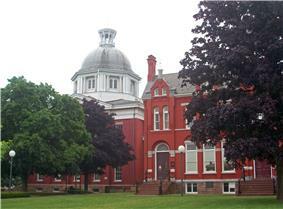 Orleans County is governed by a seven–member legislature headed by a chairman. As of the census of 2000, there were 44,171 people, 15,363 households, and 10,846 families residing in the county. The population density was 113 people per square mile (44/km²). There were 17,347 housing units at an average density of 44 per square mile (17/km²). The racial makeup of the county was 89.12% White, 7.31% Black or African American, 0.46% Native American, 0.32% Asian, 0.03% Pacific Islander, 1.54% from other races, and 1.21% from two or more races. 3.89% of the population were Hispanic or Latino of any race. 20.3% were of German, 18.3% English, 10.8% Italian, 10.3% Irish, 9.4% American and 7.3% Polish ancestry according to Census 2000. 96.0% spoke English and 3.0% Spanish as their first language. The only post-secondary education available in the county are two branches of Genesee Community College located in Albion and Medina. ^ W, Eric (2012-04-02). "Congressional District 27". View 2012 Congressional Maps. ^ W, Eric (2012-03-02). "Senate District 62". View 2012 Senate District Maps. ^ W, Eric (2012-01-25). "Assembly District 139". View Proposed 2012 Assembly District Maps.